Ambient, drone, and Berlin school are extremely niche genres of electronic music. They’re also some of the oldest, having existed for over 40 years now thanks to early sonic explorations by legends such Tangerine Dream, Klaus Schulze, and Jean Michel Jarre. However, in the age of 21st century immediacy, these genres remain a cult interest embraced only by those with the patience and curiosity to let the electronic journey unfold. Songs in this cult circle tend to span runtimes of 10-to-30 minutes and fully embrace sound design as a musical element. The pop format is (thankfully) abandoned in favor of incremental sound sculpting that paints a mental tapestry of mysterious voyages under water and flights of fancy through mountains on far distant planets. It’s the sound of science fiction for sure, but on an emotional and spiritual scale. Today, modern purveyors of 1970s styled electronic such as Zombi, Majeure, & Arc enjoy their successes with small but extremely passionate followings where pushing boundaries of sound is far more important than a marketable hit. 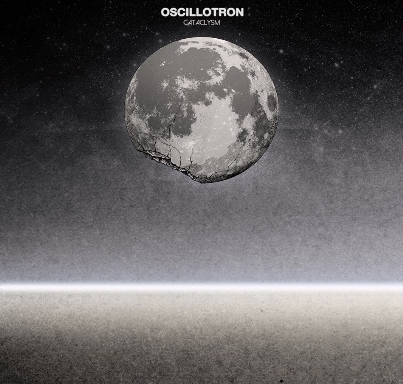 Oscillotron is another independent project that faithfully constructs intelligent meditative landscapes of synthesis. Cataclysm is their second album and contains 7 concise examples of deep moody bass arppegiations, deluxe warm pads, and subdued drums that could pass for heartbeats. Mirage opens the record with thunderous dark progressions and orchestral fervor while Twilight and Mutation maintain a dark foreboding that allows the bass and strings to meld into trance inducing placidity before the drums threaten the plains with impending doom. Spiral is a sweet reprieve that almost sounds like the love theme of an epic film. Standout track Pioneer is dominated with resonance-drenched synth lines that at times recall a muscular Zelda soundtrack featuring a lively drum kit. Terminal channels horror soundtrack zeal before seguing into a space age conclusion. Title track Cataclysm ends the record on a ghostly note with eerie pads and metronomic claves. While its clear this kind of record is not one that will attract commercial appeal due to the commitment required by the listener, it makes it all the more special in that the patience is rewarded with an auditory experience that you really cannot achieve with a 3 minute pop song. This actually sounds a good bit like the new John Carpenter album, Lost Themes II.